China's manufacturing Purchasing Managers' Index (PMI) stood at 50.4 in September, unchanged from August, while the non-manufacturing PMI increased to 53.7 from the previous month's 53.5, Xinhua news agency reported. The manufacturing PMI has stayed above the 50-point mark that separates expansion from contraction for the second month in a row, while the non-manufacturing PMI has stood above the line for seven consecutive months, according to the National Bureau of Statistics (NBS), the report said. Xinhua quoted NBS statistician Zhao Qinghe as saying that both production and demand showed signs of stabilisation in the manufacturing sector, while the non-manufacturing sector is gradually picking up steam as enterprise confidence builds strength. The NBS data are in line with the Caixin manufacturing PMI, a private gauge of manufacturing activity, which showed the index was in expansionary territory for the second time since February 2015. 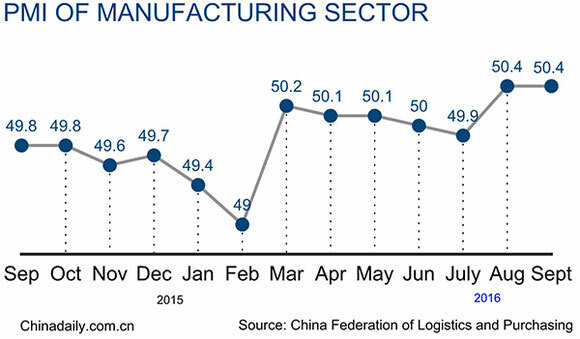 The Caixin manufacturing PMI edged up to 50.1 in September from 50 the previous month, according to a survey conducted by financial information service provider Markit, sponsored by Caixin Media. The official PMI samples 3,000 large enterprises in China, while the Caixin PMI samples some 400 small and medium-sized manufacturing enterprises.